CBD-infused beverages look set to hit the market in a big way in 2019. 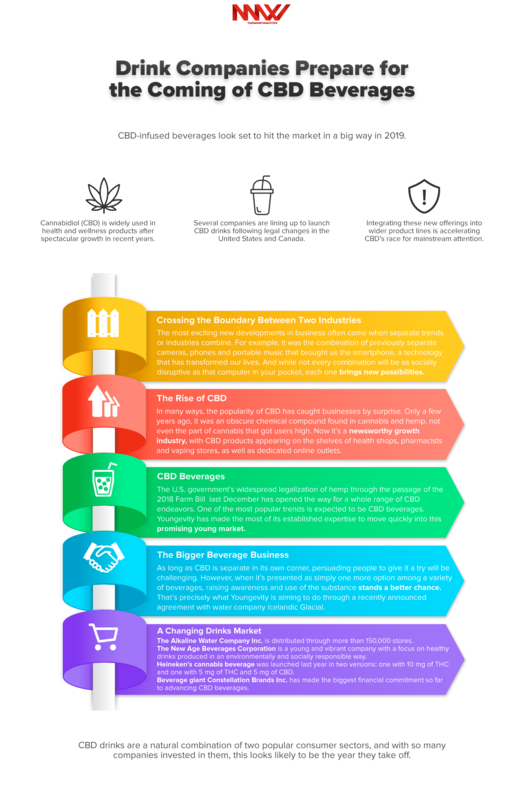 Cannabidiol (CBD) is widely used in health and wellness products after spectacular growth in recent years. Several companies are lining up to launch CBD drinks following legal changes in the United States and Canada. Integrating these new offerings into wider product lines is accelerating CBD’s race for mainstream attention. Youngevity International Inc. (NASDAQ: YGYI) (YGYI Profile) is one of the first to launch, with a CBD coffee coming in May and a CBD water in the works. The Alkaline Water Company Inc. (NASDAQ: WTER) (TSX.V: WTER), which is constantly growing its U.S. distribution network, plans to add a CBD bottled water to its range. The New Age Beverages Corporation (NASDAQ: NBEV) is adding CBD to its line of organic cold coffees and teas. Heineken (OTCQX: HEINY) has also entered the market by developing a cannabis-infused sparkling water through Lagunitas, its U.S. craft brewer. And the biggest investment in the overall cannabis space has come from Constellation Brands Inc. (NYSE: STZ), which has invested $4 billion in a Canadian cannabis company. Youngevity International Inc., an emerging conglomerate operating in three distinct business segments including a vertically integrated coffee enterprise, a vertically integrated Hemp based product development enterprise including end to end processing, and a Direct Selling Enterprise that consists of an expanding portfolio of consumer brands developed with its in-house product development team and distributed by traditional and non-traditional channels, including a multi country direct selling network. For more information, visit the company’s website at www.YGYI.com.